The newly named Piper Altaire has abandoned the original proof-of-concept Meridian fuselage in favor of a taller and wider body, which the company says is scalable for future generations. Piper Aircraft today is introducing its evolved and renamed PiperJet Altaire, showing a mockup of the redesigned fuselage and cabin interior and describing the aircraft as "the next step" in the evolution of its single-engine very light jet program. The PiperJet Altaire is based on the proof-of-concept PiperJet, which has been flying since 2008. That airplane uses the fuselage of the single-engine turboprop Meridian and, according to Piper, this fuselage did not lend itself to the company's long-range plans for scaled-up future generations. "We wanted to give our jet customers an even roomier light jet that incorporates a scalable design, paving the way for a future family of competitive business jets," said Piper CEO Geoffrey Berger. At first glance, the Altaire appears quite similar to the proof-of-concept PiperJet, with its single engine mounted in the vertical stabilizer. A closer look, however, reveals a larger, 61.5-inch-diameter circular fuselage (nine inches taller and four inches wider) and round cabin windows replacing the rectangular windows of the Meridian. A still closer look shows an expanded-chord wing and a shorter vertical stabilizer. The Altaire cabin (211 inches long, 55 inches wide and 55 inches high) is dramatically different from the cabin in the proof-of-concept airplane. The new design eliminates the through-the-cabin wing spar intrusion and allows for a 12.5-inch-wide and six-inch-deep drop aisle. There are an additional four inches of headroom and more elbow room with a nine-inch-wider cabin. Behind the main cabin is 20 cu ft of baggage space, which will be accessible in flight. In the nose is an additional 20 cu ft for baggage, heated but not pressurized. The Altaire typically will be configured for one pilot and five passengers (one of them riding in the cockpit right seat), with a storage cabinet directly across from the main door that can be replaced by another passenger seat. Other options for that space include a lavatory and a cabinet containing a mini-galley or entertainment center. The four seats in the cabin will be arranged in a club configuration. An optional modular design allows the relatively easy swap-out of those features to meet mission requirements. Other features in the cabin will include leather seats, zebrawood cabinetry and trim, cup-holders and docking stations for personal devices such as iPods. Standard cabin amenities include LED lighting and dual-zone environmental controls. A three-foot-wide cabin door includes a built-in stair for ease of entry and exit. Millennium Concepts of Wichita has been selected to provide "one of the safest and most reliable seats available for this class of aircraft," said Piper executive v-p Randy Groom. The passenger seats will include a three-point restraint system and all will have energy absorbers in the seat pan and bolsters around the torso and thighs for comfort. Up front, the PiperJet Altaire will carry Garmin's G3000 avionics suite, featuring what Piper describes as "the first touchscreen-controlled glass cockpit ever designed for light turbine aircraft." Also part of the package are three GDU 1200W displays, two GTC 570 touchscreens and GFC 700 automatic flight control system. Performance projections announced with the proof-of-concept airplane have not changed. Powered by the Williams International FJ44-3AP, the Altaire is expected to have a range of 1,200 nm with four passengers (800 pounds). Max range with a lighter load is expected to be 1,300 nm. Max cruise speed is projected at 360 knots at a cruise ceiling of 35,000 feet. Flight controls for the Altaire will be control yokes, replacing the side-stick controls tested in the proof-of-concept model. Handling will be enhanced by the Williams International FJ44-3AP engine's Exact "passive vector changing exhaust system." The design allows three to five degrees of vectored thrust, which is particularly effective in countering the nose-down pitch tendency in aircraft with an engine mounted above the centerline. This thrust vectoring is achieved not by movement of the exhaust nozzle, but by way of shaping the throat on one segment of the nozzle. When the flow through the nozzle is subsonic, typical at takeoff speeds, it conforms with the curvature of the shaped throat, thanks to the Coanda effect (the tendency of a stream of air to be attracted to a nearby surface), thereby achieving some upward thrust deflection to compensate for the high thrust line of the PiperJet Altaire's fin-mounted engine installation. But when the pressure ratio becomes supersonic in cruise, the over-expanded stream pushes away from the extended surface, reducing the vector. According to Williams, the result may be shorter takeoff field length and reduced trim drag. Berger describes the Altaire as a combination of "revolutionary single-engine performance with ground-breaking efficiency." 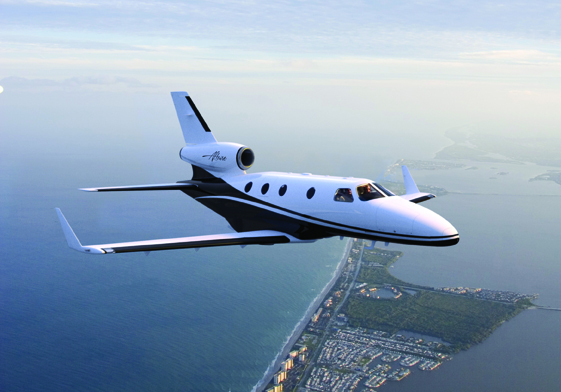 Piper claims the total variable operating cost per hour for the Altaire will be $727.36, compared with $867.16 for Cessna's Mustang and $972.88 for Embraer's Phenom 100, at average speeds of 320 knots for the Altaire, 310 knots for the Mustang and 324 knots for the Phenom 100. The Altaire carries a $2.6 million price tag, typically equipped. The price, said Groom, is about $400,000 less than the Mustang and "considerably" less than that of the Phenom 100. The airplane, he added, is now in the detailed design phase and parts fabrication has already begun. Structural testing is scheduled for next year and a first flight in 2012. The first and second conforming prototypes will be built simultaneously and a total of four airplanes will be involved in the certification flight-test program. Certification is expected at the end of 2013, with customer deliveries to begin in early 2014, slightly later than the originally expected delivery date. The Altaire will be built in Vero Beach, Fla., where Piper will reconfigure the existing plant to accommodate production. According to Groom, the company currently has orders for more than 150 airplanes backed by $75,000 refundable deposits. The next payment is not due until first flight of the first conforming prototype. According to Piper, pilot transition from the Meridian turboprop single "should be seamless," aided by the Altaire's simplified glass cockpit. Customers will receive both in-depth simulator training and line-oriented flight training. Piper has not yet announced a training partner. Hiring Groom, who came to the company a little less than six months ago with considerable experience in product support, was a major step in the creation of a service network for the Altaire. Piper expects to lay out a detailed plan for the network as the airplane nears certification. The naming of the Altaire came after much discussion, said Groom, "and a lot of suggestions." The name Altaire was selected based on the celestial importance of the star Altair. Further cementing the decision was the fact that Altair is the brightest star in the Aquila constellation, and Aquila can be translated from both Arabic and Latin as eagle or bird. Altair also happens to be the name of the lunar surface access module designed for NASA's Project Constellation.